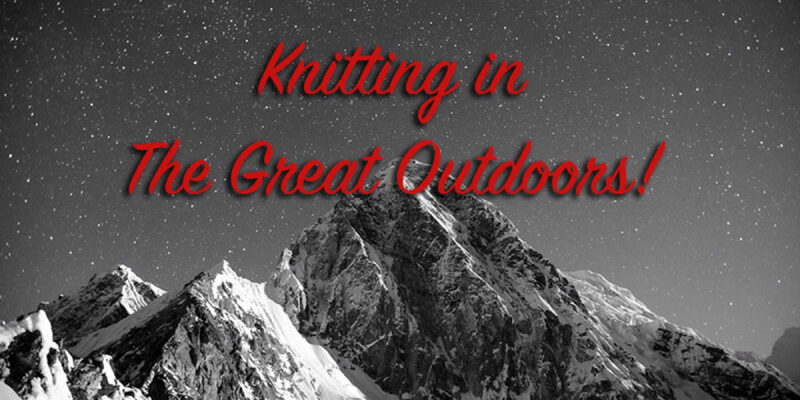 I’ve learned a great many things since moving to Colorado, but one of the most exciting things is that you can totally knit in the great outdoors. Think my confusion is odd? Well then you’ve clearly never lived in Missouri. But this summer, I’m going to explore the stunningly beautiful state of Colorado all while having the comfort and leisure time to knit outside. Camping in Missouri often means rain, humidity, bugs, drinking iodine-infused lake water, and sunburns. Campsites are always on a path that begins and ends with transport home, but you have to get there first. In Colorado, you can pave your own path, and the majority of campsites I’ve seen are massive. You set up your tent, and you don’t move it until you leave. You basically hang out in nature, have extravagant outdoor meals, and go on little day-trip excursions. And because you’re in the mountains, it gets chilly at night. To me, knitting is the best activity for such a scenario and I can’t wait to get started on these projects—perfect to knit outside. 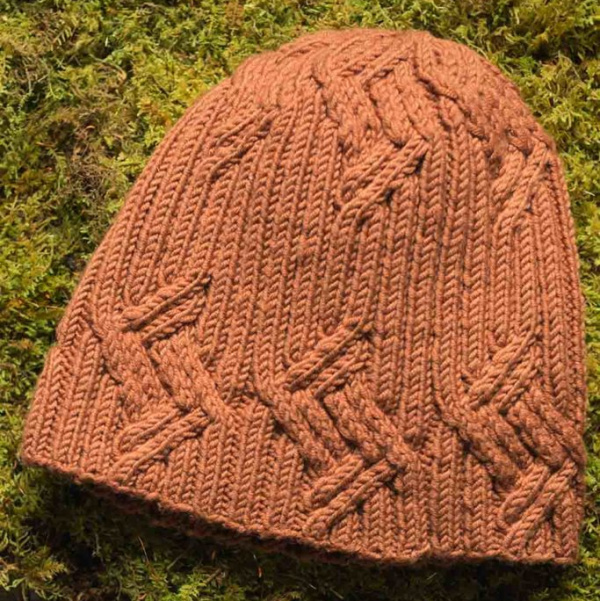 The Parallelogram Hat showcases a bold new cable and ribstitch pattern from Norah Gaughan’s Knitted Cable Sourcebook and also features an unusual and absorbing decrease technique that continues the motif into the crown. This hat is worked in a cozy, tight-twist merino that makes the cables and ribbed texture stand out. Finished Size 19.25” circumference and 9.25” tall. Yarn Sugar Bush Yarns Bold (100% extrafine superwash merino wool): #3006 creamy caramel, 2 balls. Needles Size 7 (4.5 mm): 16” circular and set of double-pointed. Adjust needle size if necessary to obtain the correct gauge. Notions Marker; cable needle; tapestry needle. Gauge 30 sts and 29 rnds = 4” in cable and rib patt, relaxed. The Logan Mitts are worked in the round from the wrist up with a thumb gusset and feature a honeycomb brioche and twisted rib. 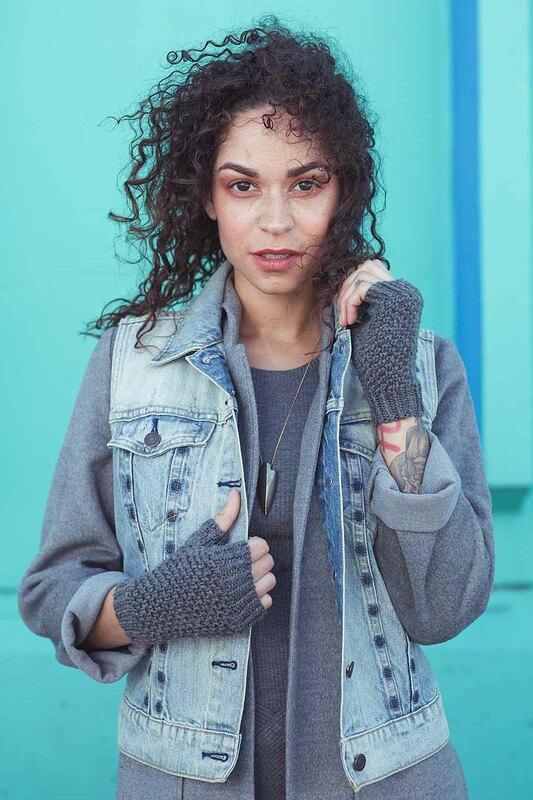 with the Cascade 220 Superwash Merino yarn ensures these mitts will keep you warm and be easy to clean. Finished Size 6.75 (7, 7.5, 8)“ palm circumference and 6.75 (6.75, 7.5, 7.5)” tall. Mitts shown measure 7”. Yarn Cascade Yarns 220 Superwash Merino (100% superwash merino wool): #27 charcoal, 1 ball. Needles Size 5 (3.75 mm): set of doublepointed. Adjust needle size if necessary to obtain the correct gauge. Notions Markers; waste yarn to be used as a stitch holder; tapestry needle. Gauge 18 sts and 44 rnds = 4” in Honeycomb Brioche st. 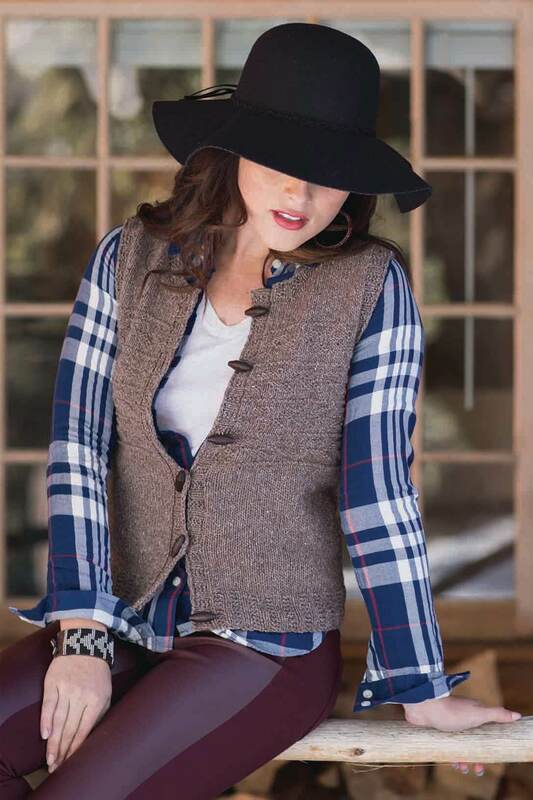 This classically shaped vest is spiced up with a tweed yarn and a textured arrow pattern. The body of the Rimrock Vest is worked with minimal shaping, creating a simple project that’s ideal to take along on summer vacation. The best part about bringing a vest along on a hiking trip is that it adds another layer of insulation without compromising your arm movement. Finished Size 33 (36¼, 39½, 44¼, 47½, 50½)” bust circumference. Vest shown measures 33″; modeled with 1″ of negative ease. Needles Size 5 (3.75 mm): 16″, 24″ and 32″ circulars (cir). Size 6 (4 mm): 32″ cir. Adjust needle size if necessary to obtain the correct gauge. Notions Markers (m); stitch holders; tapestry needle; six 11/4″ toggle buttons. Gauge 20 sts and 30 rows = 4″ in St st on larger needle. Do you take your knitting on adventures? What’s your favorite type of project to make? Here are some more projects you can knit in the wild!